All September long, my goal was to shop my closet as much as I could. Since it’s October does that mean I can stop? 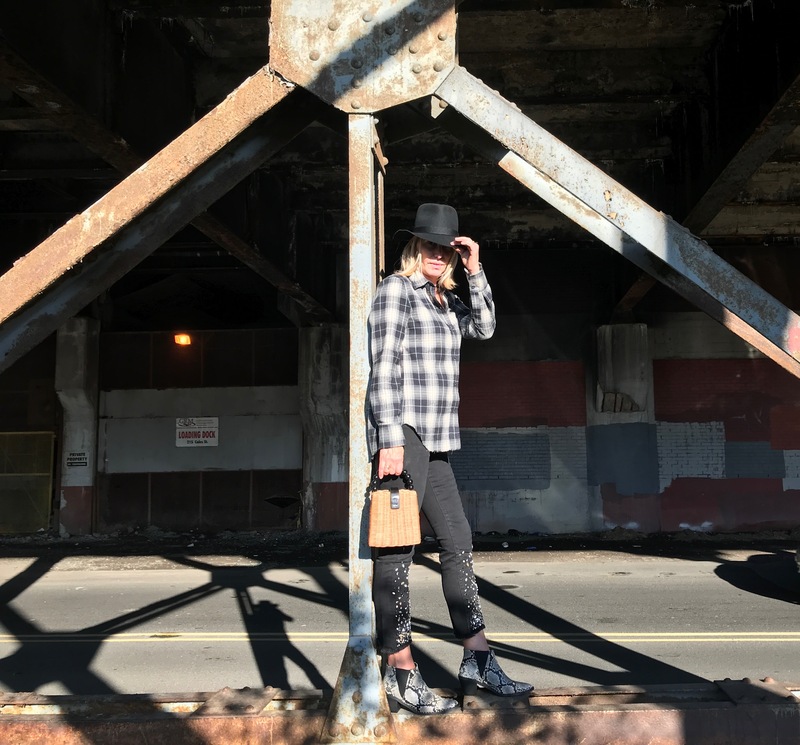 Well, let’s just say this look is a mix of old wardrobe favorites (flannel shirt as seen here, jeans, hat as seen here) and new accessories (boots and bag). 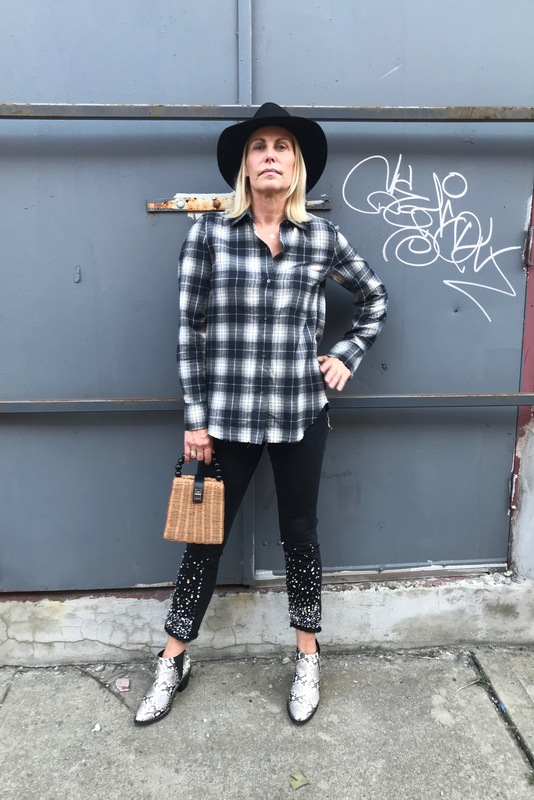 It’s also a re-mix of some of this fall’s other top trends: plaid, embellished denim and the basket bag. Let’s start at the bottom with these cowboy booties. 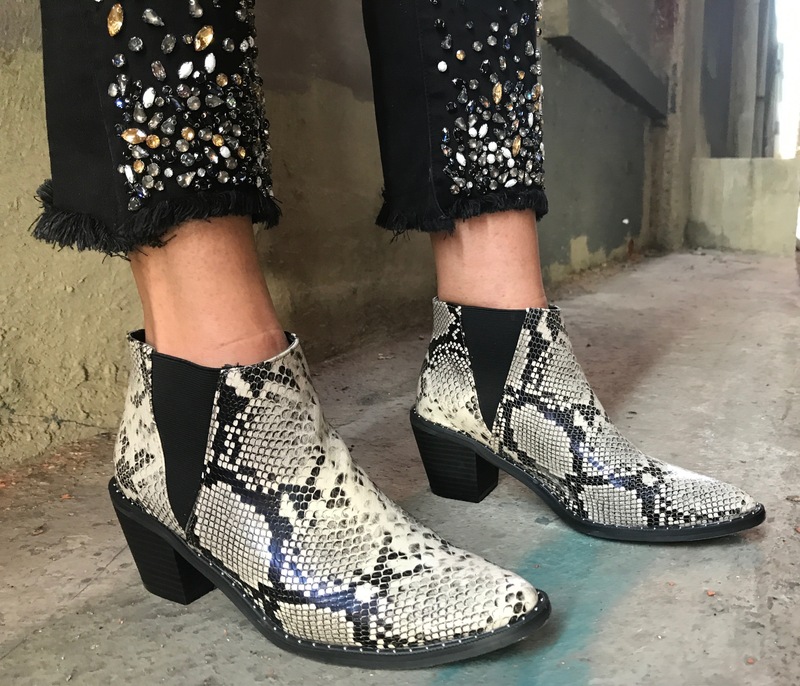 From the snake to the studs to the cuban heel, they look way more expensive than their, wait for it, under $40 price tag! 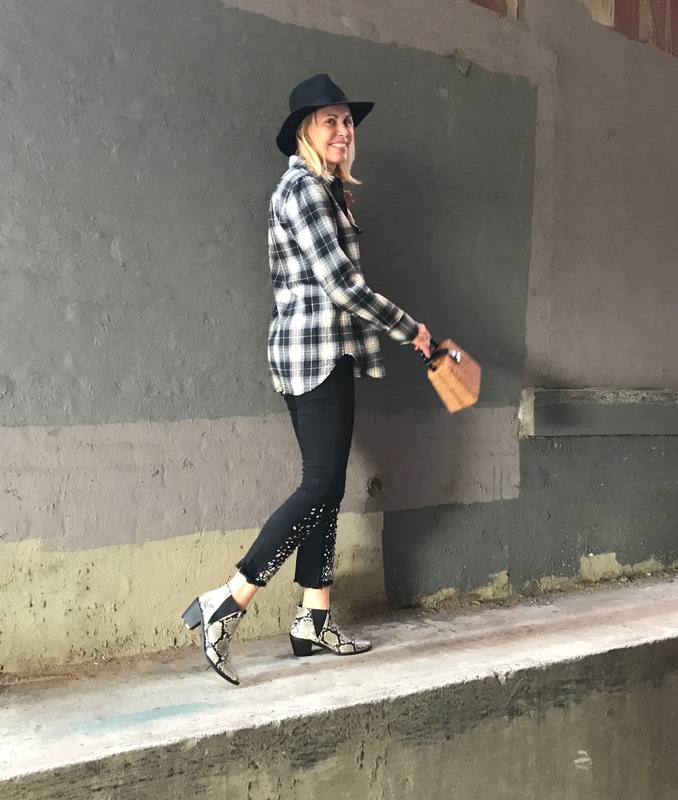 Since they’re faux leather, these cowboy booties are also vegan friendly. The stretchy panels on the shaft make for fast, easy on-and-off. And while I’ve styled them here with jeans, I think they will bring a fresh, fun edge to a black midi or maxi skirt, or even black tights and your favorite LBD. This flannel shirt caught my eye as a full price item, but I resisted the urge to buy it then and there. Lucky for me, I found it about a month later online and on sale. It’s really the softest shirt I’ve ever snuggled into, and the raw edges on the cuffs and hem add a touch of fashion finesse. My embellished black jeans are a similar story. I love love love the scattering of subtly shaded rhinestone studs, as well as the raw edging. But again, I stepped away from the “complete your purchase” icon and was rewarded with a lower price a few weeks later. Even better, not just another pair of black jeans but a statement pair of black jeans. I’ve never thought of myself as a hat person, but they are fun to wear. Especially on a bad hair day! Again, this was a great sale find. And how cute is this basket bag, which you can wear as a crossbody or carry as a top handle. 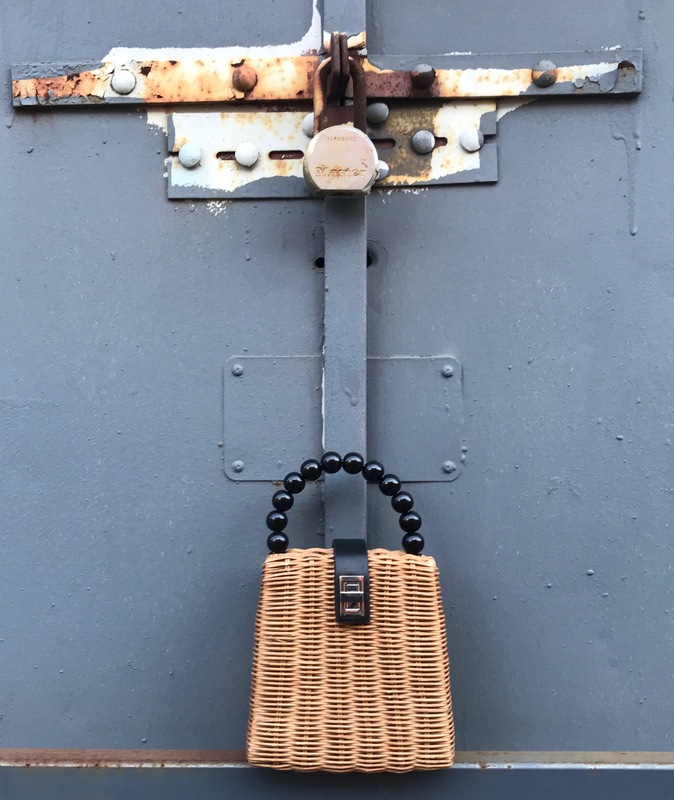 It’s warmer tone makes it look and feel autumnal instead of summery, and its beaded black handle is both chunky and chic. 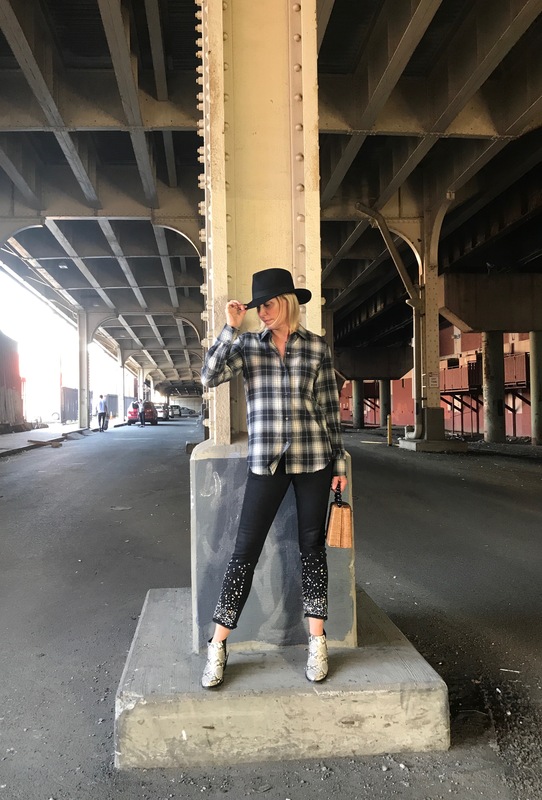 While it’s always a thrill to score a cool new fashion find, it’s also fun to re-think and reinvent wardrobe staples you might be overlooking. Don’t you agree? Boots: (Universal Thread x Target) This line is so great you have to check out this pair (white with studs!) and this (suede snake) pair, too! Shirt: (old, Vince) Great alternatives here, here and here. Jeans: (old, Pilcro) Similar here (on sale!) and here. Bag: (Zara) Also like this and this. Hat: (old, Biltmore) Similar here (on sale) and here. Need those jeans in my life! So good MP! Thanks so much, Liz. They are last year’s Pilcro from Anthro. I tried to find them again but no luck. Happy Hunting! This is such a cool outfit and I love the heels on those boots. I haven’t got myself any cowboy boots as yet so I will check them out! Thank you, Yvonne! The boots are from Universal Thread, a great new collection @ Target. They have LOTS of cool boot options! I ended up buying 3 pairs!! Happy shopping!!! So cute! I love the boots. Just bought some snakeskin ones myself! Thanks, Camille. Have to admit I now have 2 pairs of snake boots!